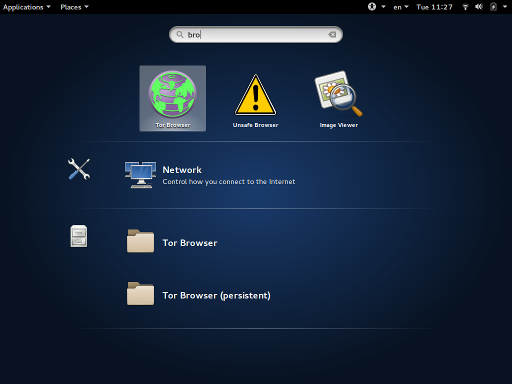 Home » Linux Distributions , Security » Linux Powerful Distros For Hacking Or Security: Tails Security Through Anonymity. Tails protects you in a number of ways. First, since all your traffic is routed through Tor, it's incredibly difficult to track your physical location or see which sites you visit. Tails doesn't use a computer's hard disk, so nothing you do is saved to the computer you're running it on. Instead, everything you're working on is stored in RAM and erased when you shut down. This means any sensitive documents you're working on are never stored permanently. Because of that, Tails is a really good operating system to use when you're on a public computer or network. Tails is also packed with a bunch of basic cryptographic tools. If you're running Tails off a USB drive, it's encrypted with LUKS. All your internet traffic is encrypted with HTTPS Everywhere, your IM conversations are encrypted with OTR, and your emails and documents are encrypted with OpenPGP. The crux of Tails is anonymity. The crux of Tails is anonymity. While it has cryptographic tools in place, its main purpose is to anonymize everything you're during online. This is great for most people, but it doesn't give you the freedom to do stupid things. If you log into your Facebook account under your real name, it's still going to be obvious who you are and remaining anonymous on an online community is alot harder than it seems. With the right tools, a computer is an open book. From the moment you boot up, your computer leaves footprints. Websites leave tracking cookies, following you from page to page and session to session, alongside the usual traces left by your IP address. Persistent logins from Google and Facebook tie each site visit to your offline identity. If anyone really wants to go after you, they can also make a direct attack, targeting malware to track your movements in the background. With the right tools, a computer is an open book. It's running Tails, an open-source operating system designed to leave as little trace as possible. Not this computer, though. 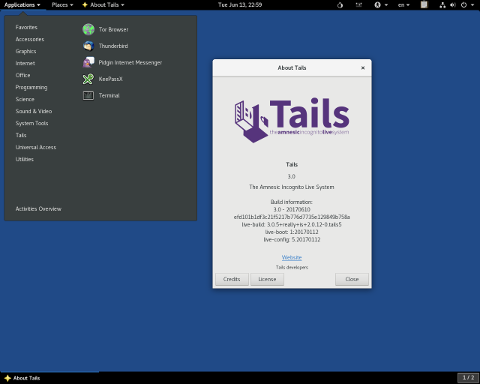 It's running Tails, an open-source operating system designed to leave as little trace as possible, after more than five years of open development. It's an amnesiac system, which means it's completely fresh every time you boot up. There are no save files, no new programs, and most importantly, it becomes a blank slate the moment you shut down. It's the digital equivalent of buying a new computer for a single session and tossing it into the river once you're done. Glenn Greenwald’s First Look Media. That trick has earned Tails a lot of attention. It’s already standard software at Glenn Greenwald’s First Look Media, where he’s called it “vital to my ability to work securely on the NSA story.” Tor researcher Jacob Appelbaum praised the project onstage at this year's Chaos Communications Congress, and in March Tails received a $50,000 grant to keep the project going. Nearly 8,500 computers booted up with Tails on a given day in March, 500 more than the month before. Those are surprisingly high numbers for a project that’s this hard to use, and does this little. But if you need a secure line, Tails is the best way to get it. In the era of the NSA, that’s a rare thing. Pros: Routes all your traffic through Tor, comes with a ton of open-source software, has a"Windows Camouflage" mode to make it look more like Windows 8. Cons: Can't save files locally, slow, loading web sites through Tor takes forever. Who It's Best For: Tails is best suited for on-the-go security. 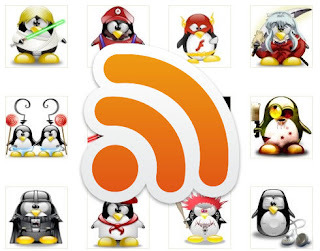 If you find yourself at coffee shops or public libraries using the internet a lot, then Tails is perfect for you. Anonymity is the game, so if you're sick of everyone tracking what you're doing, Tails is great, but keep in mind that it's also pretty useless unless you use pseudonyms everywhere online.